Many years ago I was a nanny to four little ones while I was in graduate school. Whenever we would go on outings, their mother would write her cellphone number on the inside of their arms with a pen. She reminded them that if they somehow got separated, to find another mommy and ask her to call the number. Fortunately, we were never separated, but it was good to have this plan. Fast forward several (ahem, plenty) years and here I am taking my very own children on such outings, without a good plan. 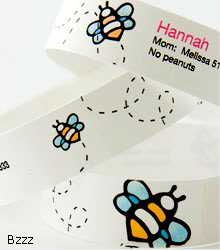 Imagine my delight when I saw a post on Stroller Traffic for these adorable waterproof ID bracelets from Mabels Labels.